Haq's Musings: Collateral Damage or Unintended Consequence? Fear of the unknown is as old as the human race. We tend to use a broad brush in characterizing as dangerous what we feel is unknown or different. It seems this way of thinking applies to most aspects of our lives when we fear something or someone, whether it is "militants" or "insurgents" or "communists" or "Islamic terrorists" or various kinds of people of different faith or color or nationality or ethnicity. It is this indiscriminate thinking that leads us to actions that cause "collateral damage" or create "unintended consequences" of the use of violence to solve problems. For example, most of us believe all micro-organisms that live in and around us are harmful germs. We tend to overuse antibiotics and antiseptics to kill all germs indiscriminately. But the latest research is showing that such indiscriminate killing of germs is hurting us. 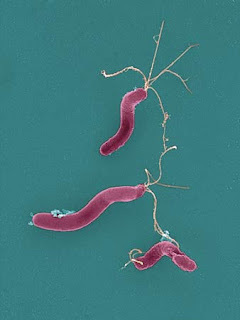 A case in point is Helicobacter pylori bacteria. Among those born in the U.S. during the 1990s, only 5% or so still carry these microbes, largely due to the indiscriminate use of antibiotics. After analyzing health records of 7,412 people collected by the National Center for Health Statistics, Dr. Blaser and NYU epidemiologist Yu Chen reported this summer in the Journal of Infectious Diseases that children between three and 13 years old who tested positive for H. pylori bacteria were 59% less likely to have asthma. They also were 40% to 60% less likely to have hay fever or rashes. To Dr. Blaser's way of thinking, antibiotics and other sanitation measures are eliminating the harm these bacteria cause at the expense of the protection they provide us, according to Robert Lee Hotz's Science Journal Column published recently in the Wall Street Journal. The latest research shows that the human body teems with so many microbes that they outnumber our own cells ten to one. Large colonies of bacteria live in and around us in a symbiotic relationship with our bodies. "They are not simply along for the ride," says Stanford University microbiologist David Relman. "They are interacting with us." Yet almost all of them are still unknown to science, since most cannot be grown and studied in the laboratory. In ways mysterious to medicine, this microbial menagerie of fellow travelers in and on us is controlling our health, affecting obesity, cancer and heart disease, among others, according to Robert Lee Hotz's column. I think there is a profound lesson for our political and military leaders in the research results from Blaser and Chen. Let us not be indiscriminate in how we fight the war on terror that must be fought. Let us not be too cavalier about causing collateral damage in this necessary war. Let us think about the unintended consequences of this war. Let us be smart rather than indiscriminate in this war.